I wonder if everyone actually knew what the definition of each of those was when they answered. I wonder if this is really what people want. The first was driven by my confusion over whether the town I grew up in would be considered a town or a “small city suburb”. 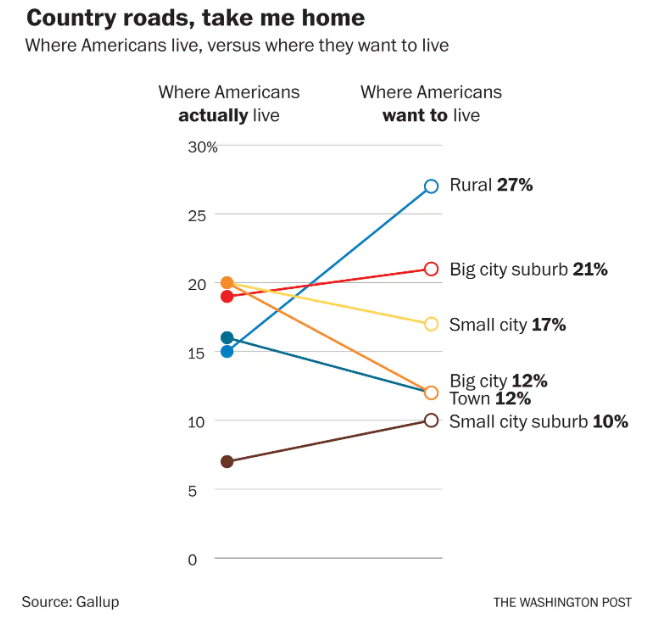 The second thought was driven by my deep suspicion that almost 30% of the US actually wanted to live in rural areas, whereas only half that number actually live in one. While I have no doubt that many people actually do want to live in rural areas, it seems like for at least some people that might be a bit of a proxy for something else. For example, one of the most common reason for moving away from rural areas is to find work elsewhere. Did saying you wanted to live in a rural area represent (for some people) a desire to not have to work or to be able to work less? A desire to not have economic factors influence where you live? Given this, it seems like if I asked any of my young coworkers if they wanted to rent a room from me in my large city suburb home, they’d say yes. And yet I doubt they actually would. When they were answering, almost none of them were talking about their life as it currently stands, but more what they hope their life could be. They wanted to get married, have kids, live somewhere smaller or in the suburbs. Their vision of living in the suburbs isn’t just the suburbs, it’s owning their own home, maybe having a partner, a good job, and/or kids. They don’t want a room in my house. They want their own house, and a life that meets some version of what they call success. Proxy Preference: A preference or answer given on a survey that reflects a larger set of wants or needs not reflected in the question. An example: Some time ago, I saw a person claiming that women should never plan to return to the workforce after having kids, because all women really wanted to work part time. To prove this, she had pointed to a survey question that asked women “if money were not a concern, what would your ideal work set up be?”. Unsurprisingly, many women said they’d want to work part time. I can’t find it now, but that question always seemed unfair to me. Of course lots of people would drop their hours if they had no money concerns! While many of us are lucky enough to like a lot of what we do, most of us are ultimately working for money. A second example: I once had a pastor mention in a sermon that as a high schooler he and his classmates had been asked if they would rather be rich, famous, very beautiful or happy. According to his story, he was one of the only people who picked “happy”. When he asked his classmates why they’d picked the other things, they all replied that if they had those things they would be happy. It wasn’t that they didn’t want happiness, it was that they believed that wealth, fame and beauty actually led directly to happiness. Again, I don’t think everyone who says they want to live in a rural area only means they want financial security or a slower pace of life, but I suspect they might. It would be interesting to narrow the question a bit to see what kind of answers you’d get. Phrasing it “if money were no object, where would you prefer to live today?” might reveal some interesting answers. Maybe ask a follow up question about “where would you want to live in 5 or 10 years?”, which might reveal how much of the answer had something to do with life goals. In the meantime though, it’s good to remember that when a large number of people say they’d prefer to do something other than what they are actually doing, thinking about the reasons for the discrepancy can be revealing. I mentioned recently that I planned on adding monthly(ish) to my GPD Lexicon page, and my IQ post from Sunday reminded me of a term I wanted to add. While many of us are keenly aware of the problem of “delusions of grandeur” (a false sense of one’s own importance), I think fewer people realize that thinking oneself too normal might also be a problem. Delusions of Mediocrity: A false sense of one’s one averageness. Typically seen in those with above average abilities or resources who believe that most people live like they do. Now I think most of us have seen this on a personal level, but I think it’s also important to remember it on a research level. When research finds things like “IQ is correlated with better life outcomes”, they’re not just comparing IQs of 120 to IQs of 130 and finding a difference….they’re comparing IQs of 80 to IQs of 120 and finding a difference. On an even broader note, psychological research has been known to have a WEIRD problem. Most of the studies we see describing “human” behavior are actually done on those in Western, educated, industrialized, rich and democratic countries (aka WEIRD countries) that do NOT represent that majority of the world population. Even things like optical illusions have been found to vary by culture, so how can we draw conclusions about humanity while drawing from a group that represents only 12% of the world’s population? The fact that we don’t often question this is a mass delusion of mediocrity. I think this all gets tempting because our own social circles tend to move in a narrow range. By virtue of living in a country, most of us end up seeing other people from that country the vast majority of the time. We also self segregate by neighborhood and occupation. Just another thing to keep in mind when you’re reading about differences. I’m having a little too much fun lately with my “name your own bias/fallacy/data error” thing, so I’ve decided I’m going to make it a monthly-ish feature. I’m gathering the full list up under the “GPD Lexicon” tab. This was intended to cover a pretty wide variety of scenarios, such as when we hear things like “women are more likely to do thing x” without being told that the “more likely” is 3 percentage points over men. While I like this term, today I want to narrow it down to a special subcase: tidal statistics. I’m defining those as….. So for example, if someone says “after the CEO said something silly, that company’s went down on Monday” but they don’t mention that the whole stock market went down on Monday, that’s a tidal statistic. The statement by itself could be perfectly true, but the context changes the meaning. Now this graph initially caught my eye because they had initially labeled it as being representative of the whole US (they later went back and corrected it to clarify that this was just for the south), and I started to wonder how this was impacted by changing demographic trends. I remembered seeing some headlines a few years back that white students were now a minority-majority among school age children, which means at least some of that drop is likely due a decrease in schools whose student populations are > 50% white. Turns out my memory was correct, and according to the National Center for Education Statistics, in the fall of 2014, white students became a minority majority in the school system at 49.5% of the school age population. For context, when the graph starts (1954) the US was about 89% white. I couldn’t find what that number was for just school age kids, but it was likely much higher than 49.5%. So basically if you drew a similar graph for any other race, including white kids, you would see a drop. When the tide goes down, every related metric goes down with it. 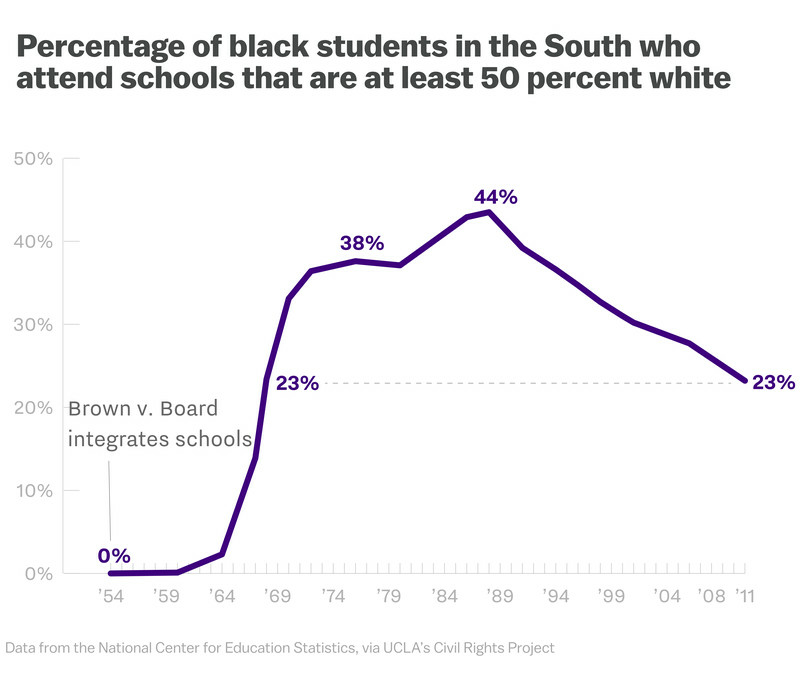 Now to be clear, I am not saying that school segregation isn’t a problem or that the Vox article gets everything wrong. My concern is that graph was used as one of their first images in a very lengthy article, and they don’t mention the context or what that might mean for advocacy efforts. Looking at that graph, we have no idea what percentage of that drop is due to a shrinking white population and what is due to intentional or de facto segregation. It’s almost certainly not possible to substantially raise the number of kids going to schools who have more than 50% white kids, simply because the number of schools like that is shrinking. Vox has other, better, measures of success further down in the article, but I’m disappointed they chose to lead with one that has a major confounder baked in. This is of course the major problem with tidal statistics. The implication tends to be “this trend is bad, following our advice can turn it around”. However, if the trend is driven by something much broader than what’s being discussed, any results you get will be skewed. Some people exploit this fact, some step in to it accidentally, but it is an interesting way that you can tell the truth and mislead at the same time. In my last blog post, I put out a call for name ideas for a particular “potentially motivated failure to recognize that the magnitude of numbers matters” problem I was seeing, and man did you all come through! There were actually 3 suggestions that got me excited enough that I wanted to immediately come up with definitions for them, so I now have 3 (actually 4) new ways to describe my problem. A big thanks to J.D.P Robinson, Korora, and the Assistant Village Idiot for their suggestions. Based on the book “Watership Down” where characters use the word “hrair” to mean “any number greater than 4”. We all have a line like this when numbers get big enough….I doubt any of us truly registers the difference between a quadrillion and a sextillion unless we encounter those numbers in our work. Small children do this with time (anything other than “right now” is “a long time”), and I’d guess all but the richest of us do this with money (a yearly salary of $10 million and $11 million are both just “more than I make” to me). On it’s own, this is not necessarily a bad thing, but rather a human tendency to only wrap our heads around the number values that matter most to us. This tendency can be misused however, which is where we get…. Also known (in my head) as the Soros/Koch brothers problem. Occasionally you’ll see references to charitable gifts by those controversial figures, and it’s always a little funny to see how people perceive those numbers based on their pre-conceived feelings about Soros/Koch. I’ve seen grants of $5000 called “a small grant” or be credited with helping fund the whole organization. You could certainly defend either stance in many cases, but my concern is that people frequently seem to start from their Soros/Koch feelings and then bring the numbers along for the ride. They are not working from any sort of standard for what a $5000 grant means to a charity, but rather a standard for what a George Soros or Koch brothers gift means and working backwards. This can also lead too…. A close relative of number blindness, but particularly focused on the size of the numbers. Taking my previous Soros/Koch example, let’s say someone had defend the “a $5000 grant is not a big deal” stance. Now let’s say that there was a typo here, and it turned out that was a $50,000 or a $500 grant. For most people, this would cause you to stop and say “ok, given this new information, let me rethink my stance”. For those suffering from Mountain-Molehill Myopia however, this doesn’t happen. They keep going and act like all their previous logic still stands. This is particularly bizarre, given that most people would have no problem with you pausing to reassess given new information. All but the most dishonest arguers are going to hold you accountable for previous logic if new information comes up. The refusal to do so actually makes you more suspect. The alternative case here is when someone decides that a small change to the numbers now means EVERYTHING has changed. For example, let’s say the $5000 turns out to be $4900 or $5100. That shouldn’t change anything (unless there are tax implications that kick in at some level of course), but sometimes people seriously overreact to this. You said $5000 and it turns out it was $4900, this means your whole argument is flawed and I automatically win. There is clearly a sliding scale here, as some changes are more borderline. A $5000 grant vs a $2000 grant may be harder to sort through. For rule of thumb purposes, I’d say an order of magnitude change requires a reaction, and less than that is a nuanced change. YMMV. Now, all of these errors can be annoying in a vacuum, but they get worse when onlookers start jumping in. This is where you get…..
Artotrogus:. I remember: One hundred fifty in Cilicia. A hundred in Scytholatronia*, thirty Sardians, sixty Macedonians. Those are the men thou slewest in one day. Pyrgopolynices: How many men is that? After reading this I got the distinct feeling that we did away with flatterer-slaves, and replaced them with social media. As someone who likes to correct others numbers, you’d think I’d be all about chiming in on Facebook/Twitter/whatever conversations about numbers or stats, but I’m not. Starting about 3 years ago, I stopped correcting anyone publicly and started messaging people privately when I had concerns about things they posted. While private messages seemed to get an amiable response and a good discussion almost 90% of the time, correcting someone publicly seemed to drive people out of the woodwork to claim that those numbers were actually right. Rather than acknowledge the error as they would privately, my friends would then turn their stats claims in to Pyrgopolynices’ numbers….numbers that people believed because other people were telling them they were true. Of course those people were only telling them they were true because someone on “their side” had said them to begin with, so the sense of check and balances was entirely fictitious. Over the long term, this can be a very dangerous issue as it means people can go years believing certain things are true without ever rechecking their math. That wraps it up! Again, thank you to J.D.P Robinson for mountain-molehill myopia, AVI for throwing the word “hrair” out there, and Korora for the backstory on Pyrgopolynices’ numbers. In related news, I think I may have to start a “lexicon” page to keep track of all of these. Okay, this is going to be another one of those posts where I make up a term for something I’m seeing that annoys me. You’ve been warned. When I was a little kid, I remember one of the first times I ever saw a buoy in the ocean. I don’t remember how old I was, but I was probably 5 or so, and I thought the buoy was actually somebody’s ball that had floated away. As the day went on, I remember being amazed that it managed to stay so close to the same spot without moving…it was far from shore (at least to a 5 year old) but somehow it never disappeared entirely. I think my Dad must have noticed me looking at it because he teased me about it for a bit, but he finally told me it was actually anchored with a chain I couldn’t see. Life lessons. I see buoy statistics most often when it comes to group differences. Gender, racial groups, political groups….any time you see a number with what one group does without the number for the other half, I’d get suspicious. For example, a few years ago, a story broke that the (frequently trolling) Public Policy Polling Group had found that 30% of Republican voters supported bombing the fictional city of Agrabah from the movie Aladdin. This got some people crowing about how dumb Republicans were, but a closer read showed that 36% of Democrats opposed it. Overall, an almost identical number of each party (43% vs 45%) had an opinion about a fictional city. Now this was a poll question designed to get people to say dumb things, and the associated headlines were pure buoy statistics. I’m sure there are other examples, but basically any time you get impressed by a statistic, only to feel a bit of a let down when you hear the context, you’ve hit a buoy statistic. Now, just like with buoys, these statistics are not without any use. One of the keys to this definition is that they are real statistics, just not always as free-floating as you first perceive them. Frequently they are actually the mark of something legitimately interesting, but you have to know how to take them. Context does not erase usefulness, but it can make it harder to jump to conclusions.